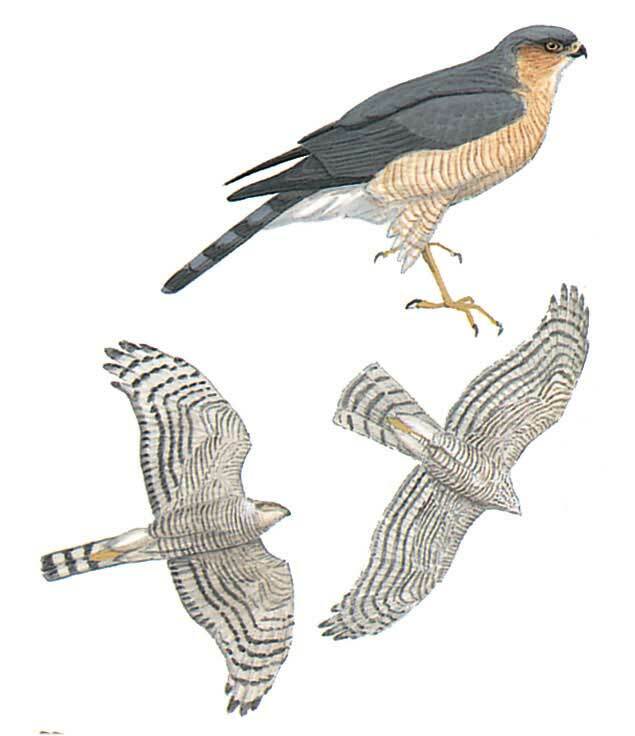 Female much larger than male, approaching male Goshawk, but wing-beats faster and lighter; rear-body thinner; wing-tips blunter; tail thinner, longer and more square-cut and head protrudes less. Series of quick wing-beats interspersed with short descending glides (stronger, straighter glides in Goshawk). Adult dark ash-grey above, barred rufous or brown below (rufous most in male); dark bands on uppertail can be inconspicuous in male; whitish supercilium in female (infrequent in male); whitish underwing without dark tip. Juvenile browner above, streaked or blotched throat and upper breast, otherwise barred below; clear white supercilium. Hunts swiftly low over ground behind cover before sudden attack or stoop on prey. Display flight with slow harrier-like wing-beats, sometimes also adopted when hunting.